As a preacher, I’m always on the lookout for sermon ideas. These ideas come from all sorts of places, but most often books are the most helpful. When I picked up 7 Truths That Changed The World: Discovering Christianity’s Most Dangerous Ideas I was about 2 paragraphs in when I knew for certain that I am holding a resource that will be used in worship. The author Kenneth Richard Samples leads us through some of Christianity’s most absurd claims from a modern viewpoint. Claims that, outside of church culture, would be looked upon with a great deal of rejection. In fact, all of the claims he addresses already do, despite these are claims we make in the church on a weekly, or even daily basis. Claims such as “Not all dead men stay dead”, focusing on the resurrection, and “God walked the earth”, focusing on Jesus as God among us to name just two of the topics. Sample offers an extensive reading list at the end of each chapter to allow readers to do further research into the topic of the chapter. What I find quite good about the book is that Sample uses a lot of scripture to defend the claims. After presenting the counter-argument, Sample goes right to the Bible to explain why the argument is invalid. I did find, however, he might have been able to strengthen his argument, in particular in the first couple of chapters, by referring to extra-Biblical sources to strengthen his argument around the existence of Christ and what he did. I also understand why Sample chose not to. Instead, letting the biblical record stand on its own as a source. It’s also great to see Sample is not afraid to take on the heavyweights of the modern religion of “non-religion.” The likes of Hitchens, Hawking, and Dawkins of the atheist movement are not ignored in this book as Sample takes on atheism and its evangelists. In all, this book is a great resource for preachers and church leaders who continue to be faithful in seeking ways in which to express our basic Christian beliefs in a world which is increasingly prone to reject these beliefs due to biblical illiteracy. 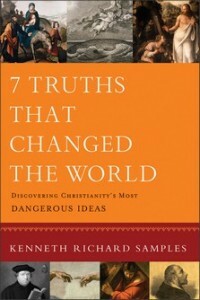 In short, I’m looking forward to my fall sermon series inspired by 7 Truths That Changed The World. Book has been provided courtesy of Baker Publishing Group and Graf-Martin Communications, Inc. Available at your favourite bookseller from Baker Books, a division of Baker Publishing Group.